Dear Cathy: My wife and I got a lease violation notice because we are feeding stray cats in our apartment complex. Can you help us? Because if the lease agreement says that you cannot feed stray animals, then wouldn’t that constitute animal cruelty because the cats could starve? Dear Frustrated: Because you live on private property, the apartment owners may, under the current law, ask their tenants to not feed feral cats. This is frustrating if you care about animals, but it’s not the entire story. 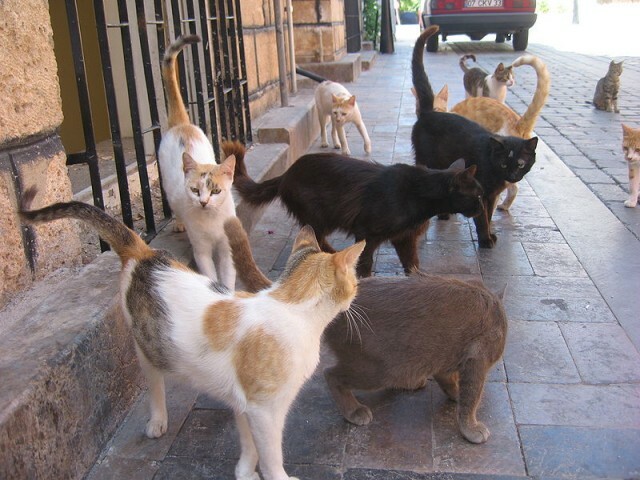 You see, while apartment complexes may not allow their tenants to feed feral cats, many of these complexes have shown enormous compassion by letting volunteers from the San Antonio Feral Cat Coalition, or SAFCC, come in to feed, trap and sterilize the cats. You can’t just feed a colony; you have to sterilize them as well to keep the colony size under control. These amazing volunteers are on a mission to care for feral cats around the city, and through their trap-neuter-return efforts, they are working to get cat colony populations under control. The good news is, there is a volunteer that feeds and sterilizes the colony at your apartment complex. Don’t rock the boat too much with your landlords as we want the apartment complex to continue letting the volunteer onto the property to care for these felines. I hope knowing there is a volunteer taking care of these felines puts your mind at ease. If you want to help cats more, you can become a feral cat colony caretaker yourself via training with SAFCC. Want to learn more? This SAFCC video explains the Trap-Neuter-Return system in more detail.